The Moms Co. 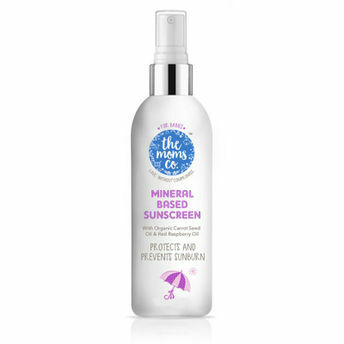 Mineral Based Sunscreen is a SPF 50+, PA+++, Water-Resistant, Toxin-Free sun protection cream created to protect delicate skin of your baby from harmful UV-A & UV-B rays. With it's unique combination of Titanium Dioxide, Zinc Oxide and powerful oils like Pongamia Glabra Seed Oil, Organic Carrot Seed Oil and Red Raspberry Seed Oil to nourish and hydrate your baby's delicate skin.